The contentious Georgia gubernatorial battle between Republican candidate and two-term Secretary of State Brian Kemp and Democratic challenger Stacey Abrams will see another day. The closely watched contest in the Peach State remains down to the wire, as ballots are still being counted. As of 2 a.m. ET, Kemp was just clearing the 50 percent threshold at 50.3 percent, but if his share of the vote falls below 50 percent, Georgia law states that the race would head into a runoff on Dec. 4. "Democracy only works when we work for it," Abrams said Tuesday night before a crowd of supporters. "When we fight for it, when we demand it, and apparently today, when we stand in lines for hours to meet it at the ballot box -- that's when democracy works. I'm here tonight to tell you votes remain to be counted. There's voices that are waiting to be heard. "I promise you tonight, we're going to make sure that every vote is counted," she said. "Every, single vote." "I made you a vow, no one would be unseen, no one would be unheard, no one would be uninspired," Abrams said. "Tonight we have closed the gap between yesterday and tomorrow. But we still have a few more miles to go." The Abrams campaign said that they don't expect to concede overnight, and that they believe there are enough votes still outstanding to force a runoff. ABC does not project races that fall within a margin of 1 percentage point, because of concerns about errors in the vote tabulation or possible outstanding votes still to be counted -- and that applies in Georgia, too, where Kemp leads Abrams 51 percent to 48 percent. ABC will not project if a candidate is within 1 percentage point of 50 percent. 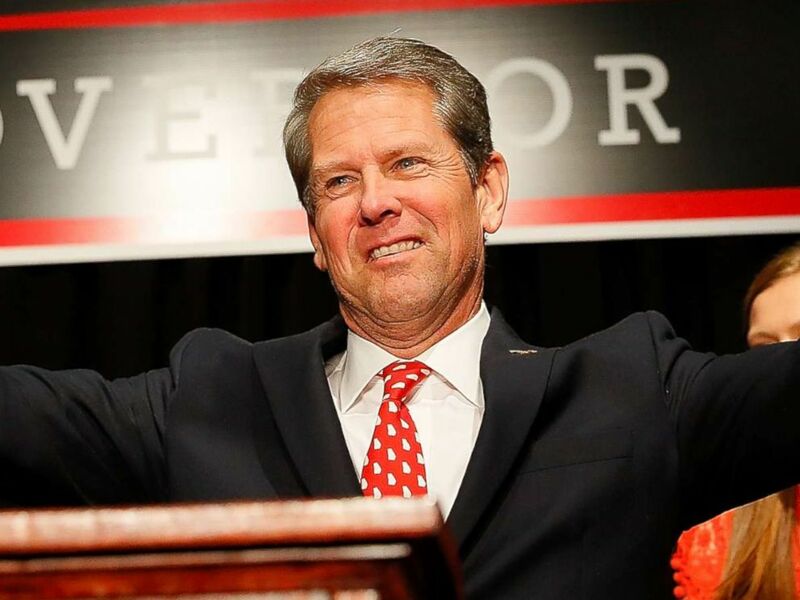 Kemp took the state in Athens early Wednesday morning, and in a much more subdued tone, he told the crowd, "There are votes left to count, but we have a very strong lead." "The math is on our side to win this election," he said. Throughout the campaign, Kemp framed himself as the "politically incorrect" candidate who often capped off his eyebrow-raising comments from the campaign trail with, "Yep, I just said that." 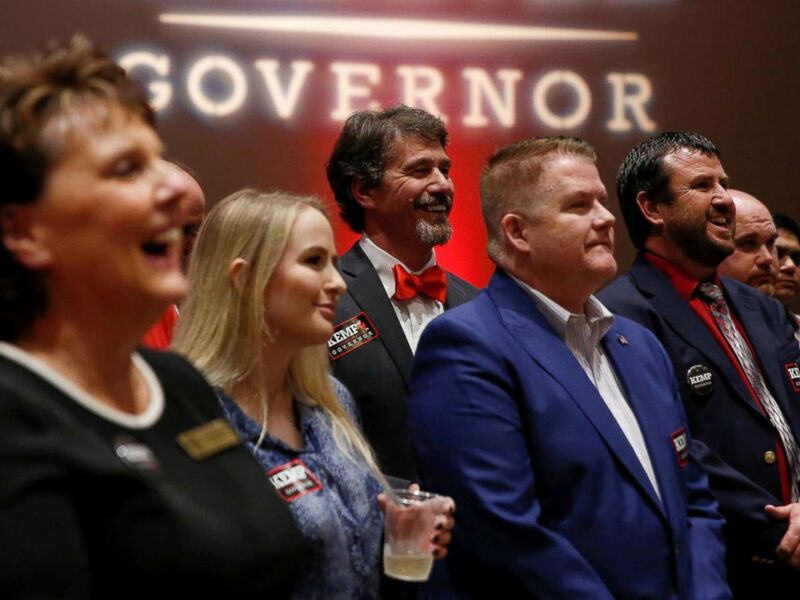 Brian Kemp supporters listen to a speaker as they wait for poll numbers to come in at Republican gubernatorial candidate Brian Kemp's election night party in Athens, Ga., Nov. 6, 2018. Kemp's role as Georgia's secretary of state, however, came under scrutiny during the race -- as that office oversees the state's elections -- and he faced allegations of rampant voter suppression. Kemp vehemently denied any wrongdoing. He also overcame 11th hour allegations that he misused the power of his office by announcing a last-minute investigation into election hacking by Georgia Democrats without publicly providing any evidence. 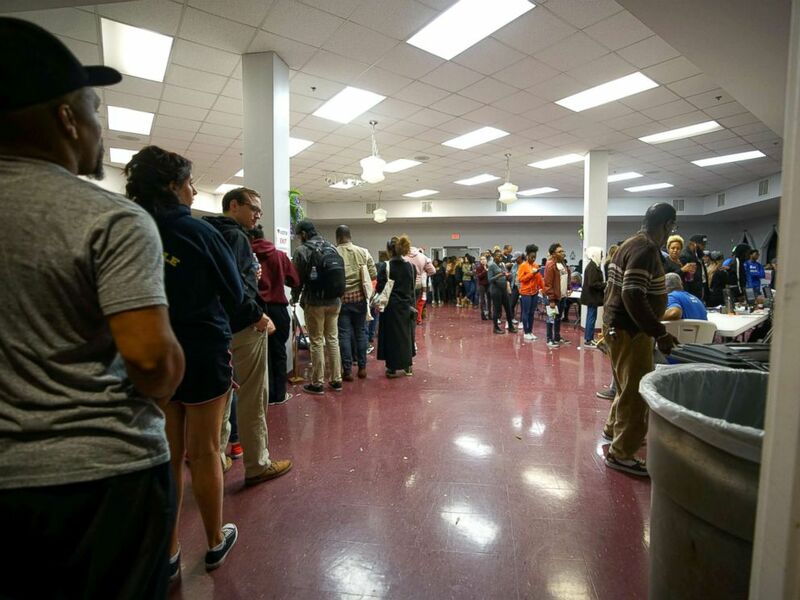 A long line remains past the 7 pm cut off for midterm elections at Liberty Baptist Church in Atlanta, Nov. 6, 2018. 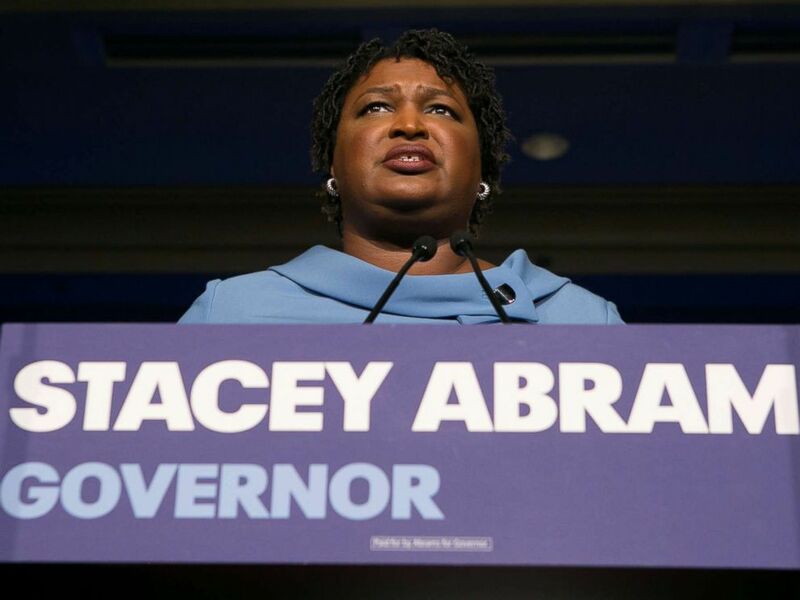 Abrams hopes to capitalize on record minority turnout in the state, and if elected, the former Democratic leader in the Georgia House of Representatives would be the first female African-American governor in the country. On Tuesday evening as polls closed in Georgia, a group of voters represented by the group Protect Democracy filed a federal lawsuit in Atlanta demanding that Kemp recuse himself of his powers to further run the 2018 election. Kemp's role in running his own election "violates a basic notion of fairness," the lawsuit states. "Defendant’s clear bias in favor of his own candidacy demonstrates the truth of the axiom that no man may be the judge in his own case," it adds. 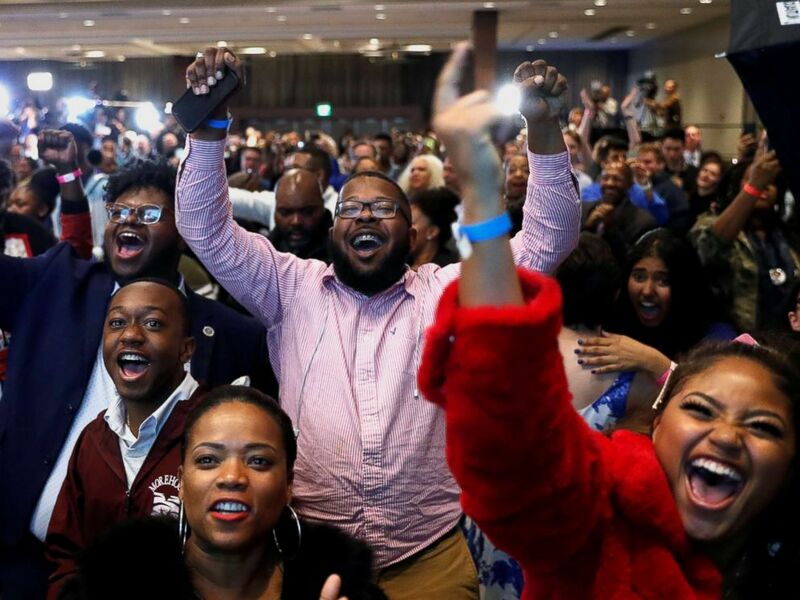 Supporters react after the Abrams campaign announced they were closing the gap during a midterm election night party for Georgia Democratic gubernatorial nominee Stacey Abrams in Atlanta, Nov. 6, 2018. The plaintiffs are seeking a temporary restraining order barring Kemp from being involved in the counting of votes, the certification of results, or any runoff or recount procedures that would normally be exercised by the Secretary of State’s Office or the Board of Elections, on which he also sits. Bryan Sells, attorney for the plaintiffs, told ABC News that this lawsuit is in part a reaction to Kemp’s "escalation of hyper-partisanship in the last couple of days.” This case won’t be heard for a day or two, since it was filed at 5 p.m. Tuesday, but they needed to get it filed before results came in “so it wouldn’t look like a reaction to the results or sour grapes." ABC News' Lee Ferran, James Hill, Victor Ordonez and Zunaira Zaki contributed to this report.